From the Moon to the Belly is a seven-card limited edition postcard project and socio-cultural exchange between Laakkuluk Williamson Bathory and myself. For this project Laakkuluk and I collected postcards from where we live in Iqaluit and New York City, using images of one another to disrupt prevalent iconography found in tourism. This project is about asserting control, traveling spirits and overcoming stereotypes. The project moves forward with new and old imagery beyond the parody of representation that exists for Indigenous people and place in North America. By inviting viewers to use and mail the cards, we further foster exchange across all boundaries. 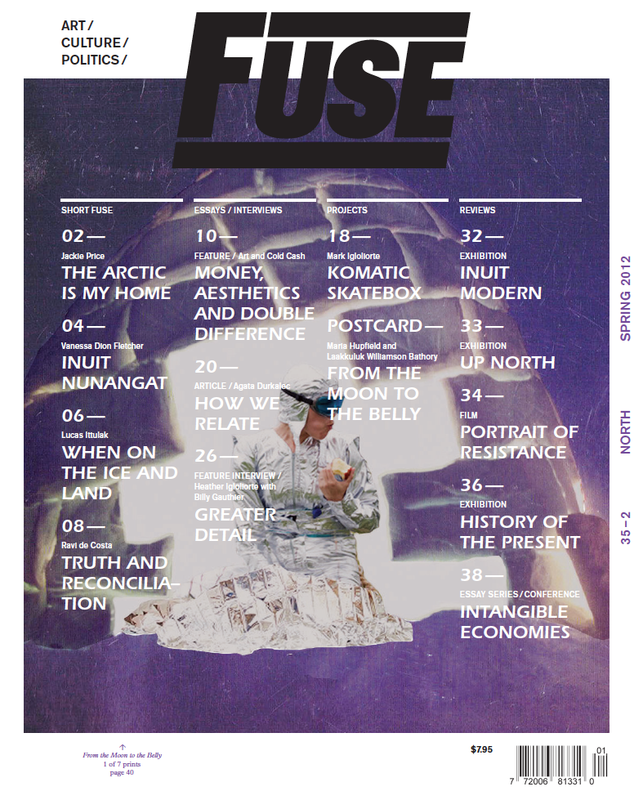 Each copy of the print edition of FUSE 35-2 States of Postcoloniality/NORTH contained one of the seven postcards. Laakkuluk Williamson Bathory is an uaajeerneq (Greenlandic mask) dancer, a storyteller and a poet. She is a Kalaaleq (Inuk) based in Iqaluit, Nunavut. Uaajeerneq is enshrined at the hearth of Greenlandic performance: a clownish dance that is highly sexualized, frightening and hilarious. It teaches children about panic, adults about boundaries—or the lack thereof—and examines the limits of human experience in the unknowable immensity of the universe. Bathory published in an anthology of Canadian poetry Pith and Wry (2010), and is currently pursuing her Masters Degree in Psychiatry at McGill University. I am Lady Moonrider, a silver suited time traveler. Currently based in Brooklyn, New York, my work explores universal conditions, locating the body as a site of resistance and agency through the use of actions, objects and images.